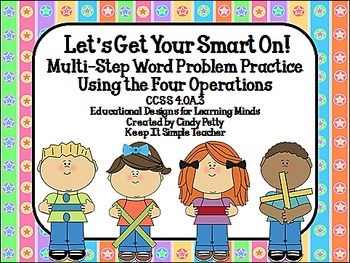 This resource includes 24 multi-step task cards using real world scenarios for the word problems, PLUS an “Extended Thinking” option for enrichment or extension when needed- MAKING A GRAND TOTAL OF 72 POSSIBLE MATH CALCULATIONS! Printable answer documents are included to help with the issue of student accountability- as we all know, it is difficult for some students to stay focused on the task, especially in less structured settings such as math centers or small collaborative groups. A printable answer document allows you to provide a visual piece for the student to use as an organizational tool. DIFFERENTIATION can be addressed using the answer document as well. By circling the specific task card numbers you want a student to complete, you can individualize the work for each student as needed. 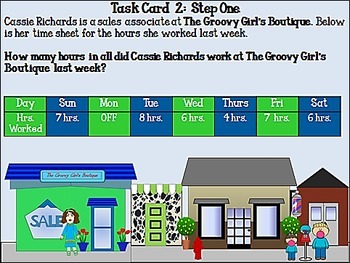 Task cards are written at different levels of difficulty and can help you address these issues. DOCUMENTED PIECES OF AUTHENTIC WORK are sometimes required for math portfolios, special education referrals, or proof of time on task, and student answer documents are excellent pieces of documentation. They are also excellent visual pieces for parent teacher conferences! 2 answer key formats are included- as task cards- if you prefer that students check their own work and also in a teacher-friendly format for checking when given as a graded assignment. With all of the interruptions and unexpected events that can occur during the course of the school day, these types of tasks are wonderful to use with unexpected transitions because they continue to provide meaningful practice in a fun format. Use this resource with math centers, on white boards, as math journal entries, for early finishers, with small collaborative learning pods, during class transitions, etc. You can never have too many of these in your teacher toolbox! Happy teaching!